divecmd is a suite of open source command-line UNIX tools to extract and manipulate dives from dive computers. Why use it instead of, say, Subsurface? Because it's built to work in a command-line workflow with other command-line tools for processing, such as grap(1) piped into groff(1) or LaTeX. In reality, I usually archive my dives after each day of diving to prevent me from overrunning the computer's internal memory and losing dives. Want to see a full analysis of these dives in PDF? To use divecmd, you'll need a reasonably up-to-date UNIX system (OpenBSD, Linux, Mac OSX, etc.). You'll also need the excellent libdivecomputer, which does the heavy lifting to interface with your device. Just run ./configure, sudo make install (or doas). The dcmd2grap(1) utility converts from XML into the grap(1) format. Aside: why grap(1)? Because it fits into the standard piped UNIX workflow. 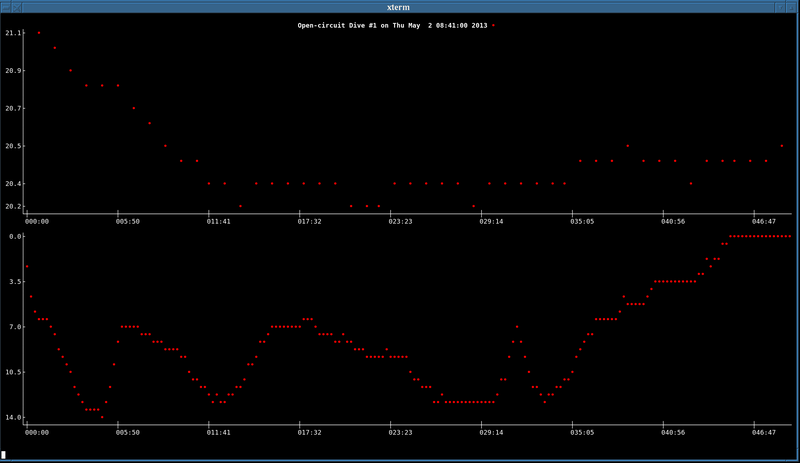 I can send the output directly into groff(1) without needing to manage the intermediary files of gnuplot or LaTeX. I use these other tools all of the time, but prefer to avoid them for that reason. See also dcmd2pdf(1), which manages the groff pipeline. There are a number of graphing modes available to dcmd2grap(1). In all of them, I use daily.xml, multiday.xml, day1.xml, and/or day2.xml, as input. The graph names (e.g., aggr ) are used in the -m argument. 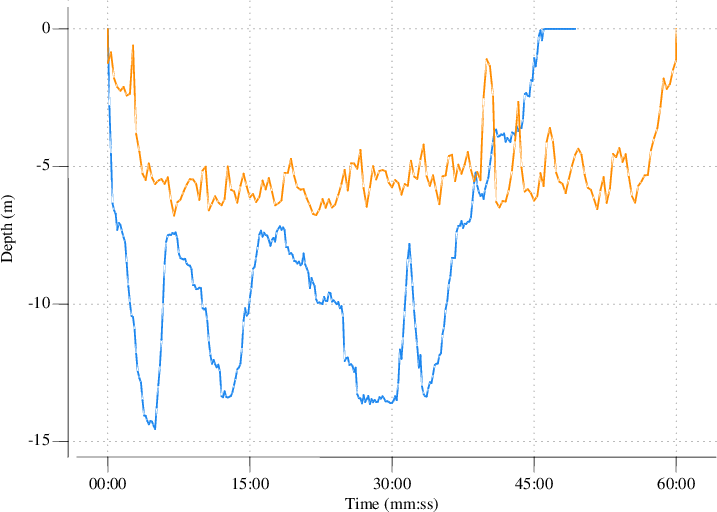 Stacked dives (multiple dives) split by date with -sdate and showing ascent and descent velocities with -d.
Line graph connecting ( aggregating ) subsequent dives with real time (relative to the beginning of the first dive) on the x-axis and depth on the y-xais. 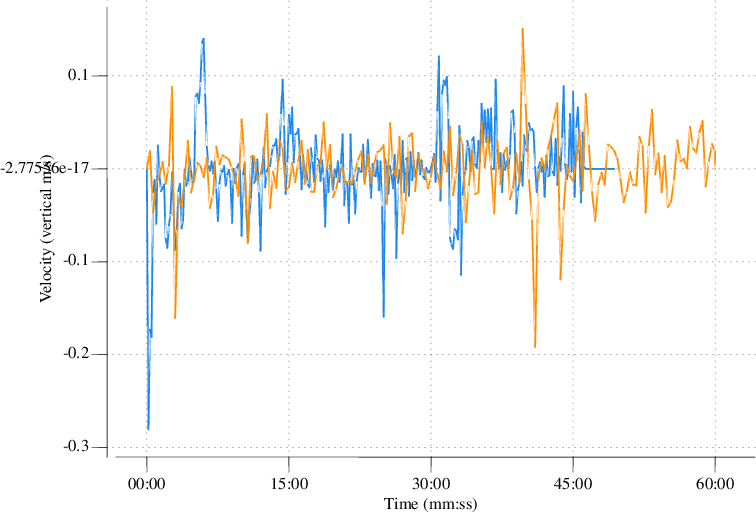 See stack for how this looks when dive profiles are super-imposed instead of laid side-by-side. Note: this also has a derivative mode for viewing descent and ascent velocities. Also available as stacktemp , for stacked dives. This shows the temperature recorded by your dive computer, either as an aggregate or stacked. 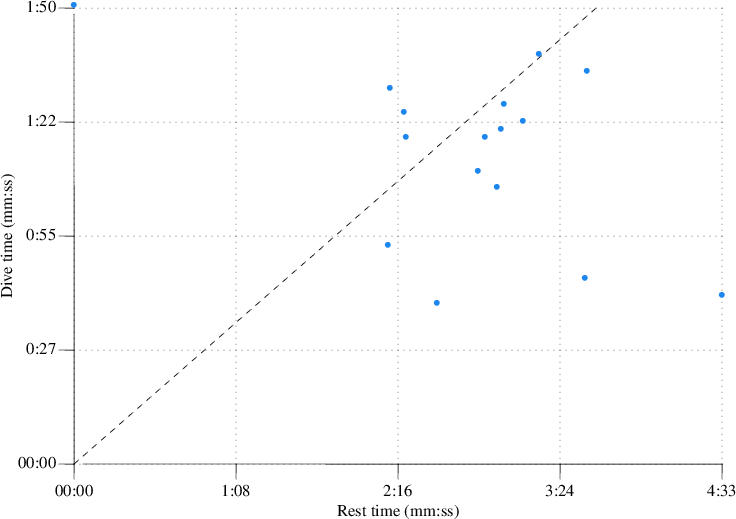 Impulse graph with each dive's rest time (surface interval) on the positive y-axis and dive time on the negative y-axis. The recommended rest time (twice the prior dive) is also shown when at least one dive profile is in free dive mode. See restscatter for how this looks in a scatter graph. 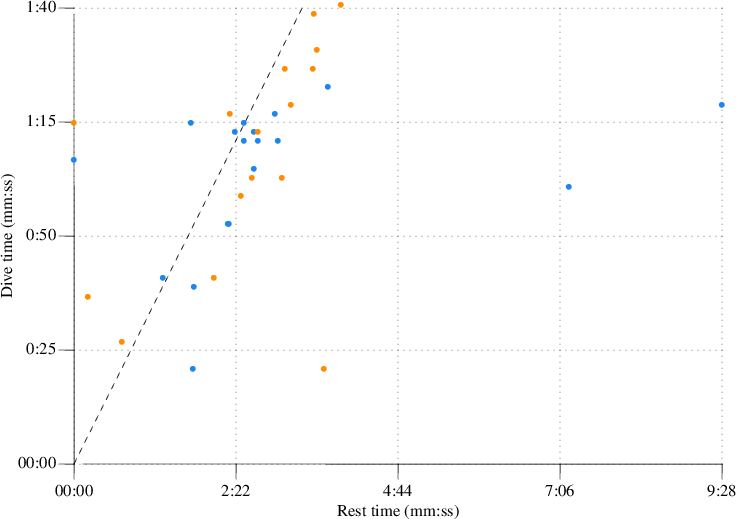 Scatter graph with points corresponding to dive time and rest time. A line with minimum suggested free diving interval is shown (twice the dive time) if any of the dives are free dives. 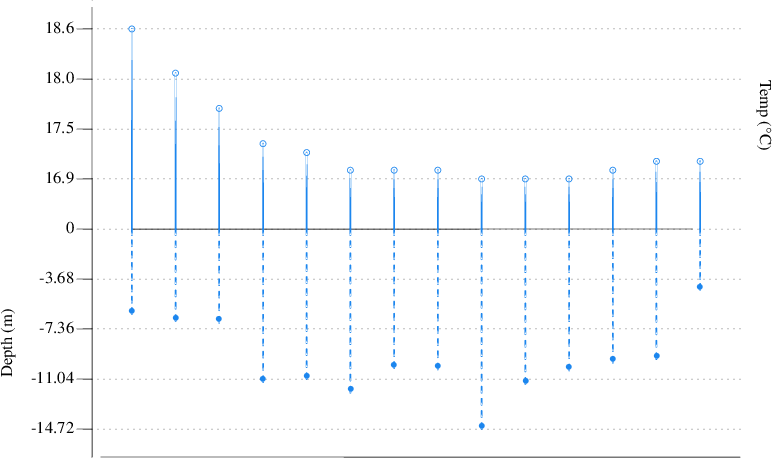 See rest for how this looks in an impulse graph. Same as restscatter but with -sdate specified. Here we're looking at two dive dates coloured differently. 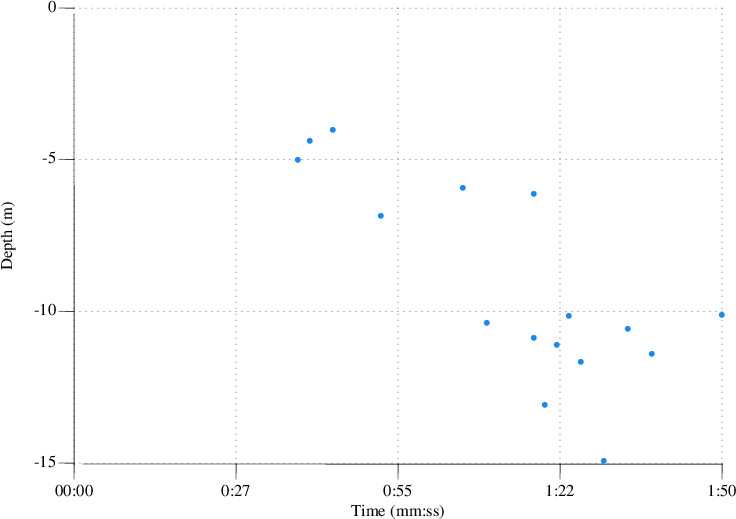 Scatter graph with points at the intersection of dives' maximum depth and time. See summary for how this looks in an impulse graph. 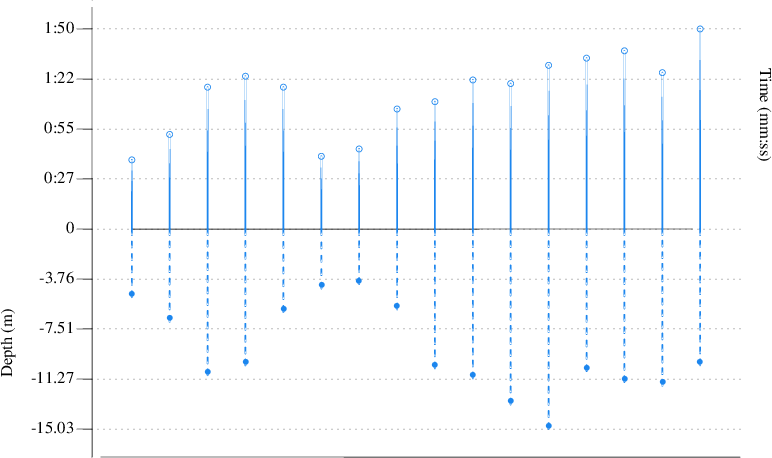 Default line graph with dives layered over one other, dive time on the x-axis, depth on the y-axis. 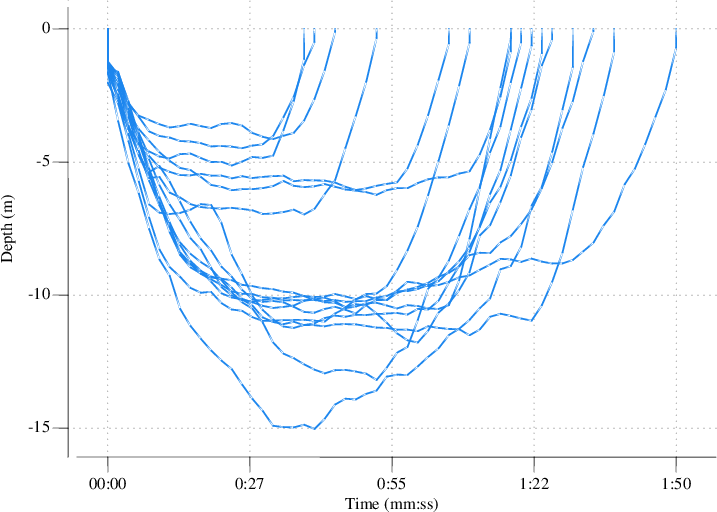 See aggr for how this looks when dive profiles are laid side-by-side instead of stacked. Version of stack split (with the -sdate argument) for multiple days' diving. 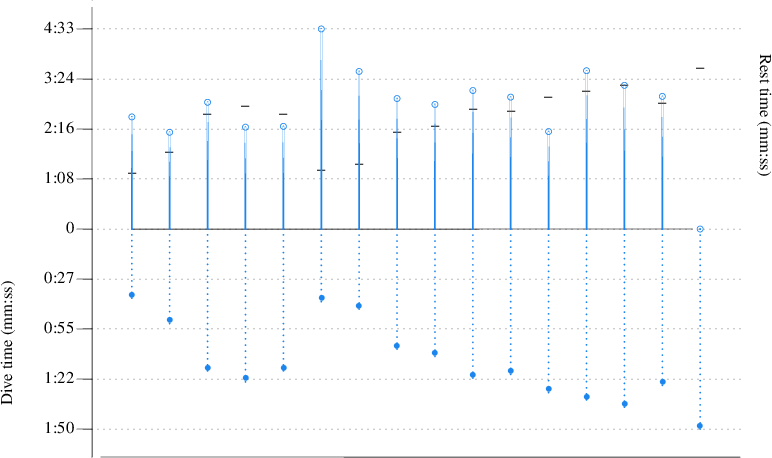 Each independent dive is shown on the x-axis with the maximum depth and time above and below, respectively, the y-axis. See scatter for how this looks in a scatter graph. 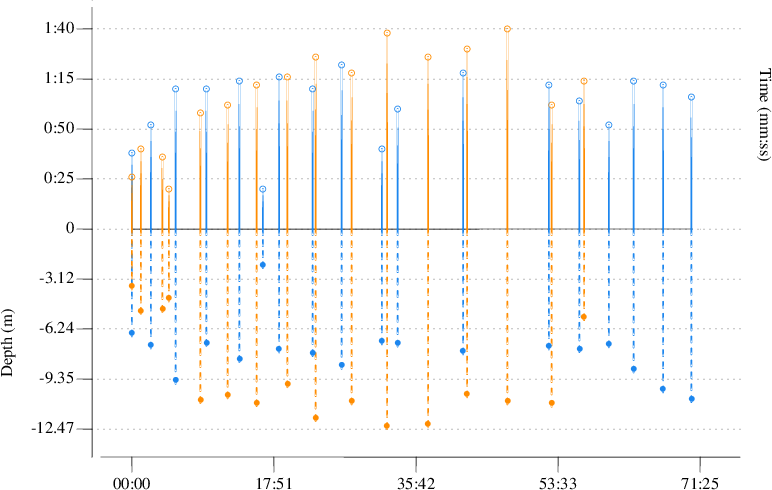 Like summary, except dives are shown on an x-axis of their start time relative to the first dive in a grouped sequence. This example shows two dives sequences split by -sdate. Each independent dive is shown on the x-axis with the minimum tepmerature and time above and below, respectively, the y-axis. This is shown with -a to de-linearise the temperature values so that they don't cluster. 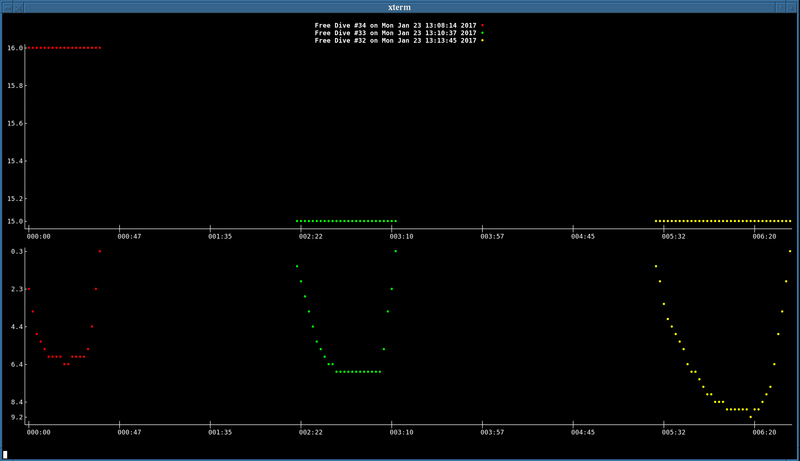 The divecmd suite also has dcmdterm(1), which formats graphs on a UNIX terminal. This is useful for a quick peek at one's dives. It was the first output mode I wrote, just to test that dcmd(1) was exporting reasonable data. dcmdterm(1) doesn't have as many fancy modes as dcmd2grap(1), but it's still a quick and easy way to see one's dives. Especially when setting up a groff(1) pipeline takes too many characters. Screenshot of the terminal mode. The temperature of a longer dive is shown on the top frame; depth, in the lower frame. The arguably most-used output mode is also the simplest: dcmd2json(1), which converts graphs to JSON. I use it constantly for divelog.blue, specifically to show the dive profiles. Technically, I could simply bundle the native dcmd(1) output directly and use an XML-to-JSON formatter in the client, but this is easier. As much as I use dcmd2grap(1) and friends for my needs, others prefer using tools like Subsurface To do so, one needs to be able to export into a format used by Subsurface. The divecmd suite has dcmd2csv(1), which exports a (for the time being minimal) set of information in CSV format. This can then be imported into Subsurface using the import utility. The helpful dcmdls(1) tool accepts a set of files, groups them by dive computer and diver, and lists their contents. This makes browsing through a lot of dives much easier! For integration with Subsurface, I also provide dcmd2ssrf(1) and ssrf2dcmd(1), which convert into and out of the Subsurface native XML format. 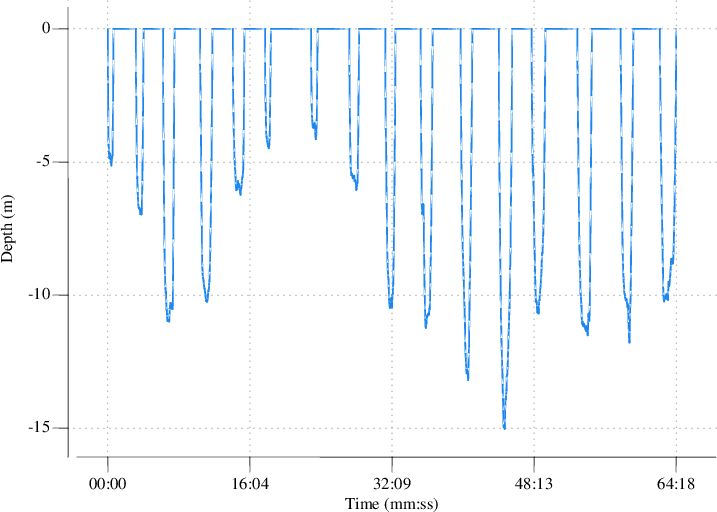 Fully support decompression and pressure recordings when converting into and out of Subsurface log files. 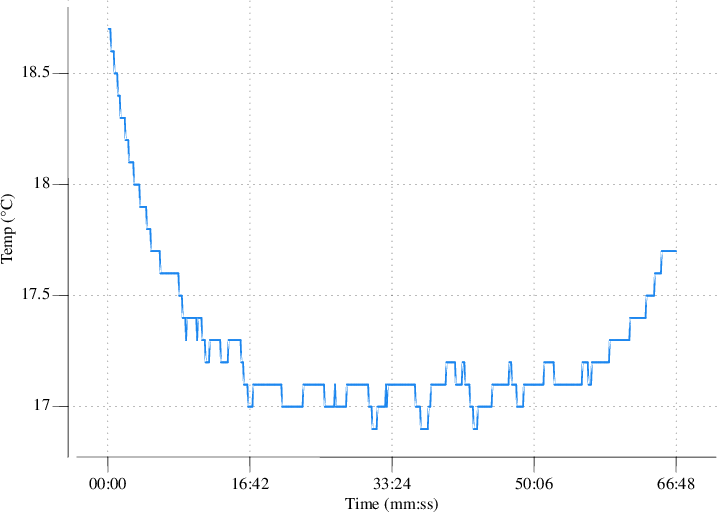 I can now export, convert-out, convert-in, then import and it's the same dive profile. Add more documentation into parser and clean up parser more. Parse flags on events. Add dcmd2ssrf(1) to export from dcmd(1) dives into Subsurface. Clarify that pressure sensor may refer to nonexistent tanks. Automatically add these tanks, if possible. Fix printing of tank list. The ssrf2dcmd(1) tool is almost completely finished. It still needs work for decompression stops, however. Clarify the relationship between tanks (cylinders) and gasses. In libdivecomputer, a dive can have disconnected cylinders and gas mixes. In Subsurface, these are always connected. These values are now printed and parsed properly. Allow for multiple tank pressure reports. This happens when (for example) deco diving with a wireless gauge on both back-gas and deco stage. Allow the vendor and product to be pulled from Subsurface output files, as well as pressures for multiple tanks. Allow for CNS values. Fix how <gasmix>es are referenced by a <gaschange>. Fix up how dcmd2grap(1) displays non-free (i.e., singleton) dives. Rename binaries for brevity: divecmd is now dcmd(1), divecmd2list is dcmdls(1), divecmd2divecmd is dcmdfind(1). divecmd2term is dcmdterm(1), and all converters have divecmd shortened to dcmd . Introduce an experimental utility, ssrf2dcmd(1), for importing from Subsurface export dives. Have unset dive type be listed when listing dives. Fix gas mix error check. Add tank pressure recognition. Graph lines (not just points) in dcmdterm. Have dcmd2pdf(1) and dcmd2ps(1) call the proper binaries and now also make sure the formatter exists. Add in support for gas change sample types. Also have the fingerprint take into account the diver identity in case you want to keep track of the dive computers for two people with the same model. Make human-readable the default for list view. Have divecmd2list(1) show average temperature, if found. Also show parse identifier, for easier use with divecmd2divecmd(1). Significantly improve the utility of divecmd2divecmd(1), allowing it to extract certain dives (by date ranges and mode, for the time being) from a larger dive file. Also fix divecmd2term(1) to work better when used in a pipe, fix its arguments (-n for dumb mode, with UTF-8 and colours by default), and also allow for inhibiting the display of temperatures or the legend. Start using oconfigure for portability glue. This is more consistent with other BSD.lv projects. Also add divecmd2list(1) and make divecmd2divecmd(1) much easier to use. Both of these are made possible by simplifying the backend parser. Built with sblg on OpenBSD.